Butter and flour 3 (9-inch) cake pans. Cut 3 circles of waxed paper or parchment paper to fit the bottoms of the pans, then press them in. Add the vanilla, cocoa, baking soda, and salt and mix. Add 1/2 of the flour, then 1/2 of the sour cream and mix. Repeat with the remaining flour and sour cream. Drizzle in the hot coffee and mix until smooth. The batter will be thin. Pour into the prepared pans and bake until the tops are firm to the touch and a toothpick inserted into the center comes out clean (a few crumbs are okay), about 35 minutes. Halfway through the baking, quickly rotate the pans in the oven to ensure even baking, but otherwise try not to open the oven. In a mixer fitted with a paddle attachment, cream the butter and cream cheese together until smooth. Drizzle in the melted chocolate and mix. Add the sugar, 1 cup at a time, mixing after each addition. Mix until well blended and fluffy. 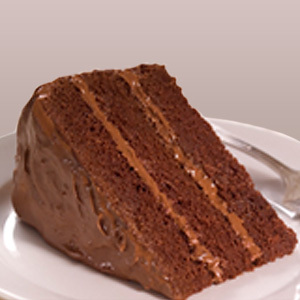 To frost the cake, use a spatula to cover 2 of the cake layers with frosting. Stack them together. Flip the third cake layer over and rest it on the top to create a very flat top for the cake. Frost on the sides and top.